This article is about the community in St. Johns County, Florida. For the community in De Soto County, Florida, see Nocatee, DeSoto County, Florida. 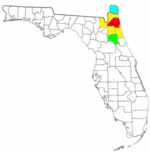 Nocatee /ˈnɒkətiː/ is an unincorporated planned community located primarily in northern St. Johns County, Florida. Part of the development lies within Jacksonville in Duval County. It is near Ponte Vedra Beach in Florida's First Coast region and sits on 13,323 acres (5,392 ha) of land. It was approved in 2001 as a Development of Regional Impact (DRI) under Section 380.06 of the Florida Statutes. The population of Nocatee had a 34.6% increase from the year 2015 to 2016, and it is the second fastest growing community in the nation. Nocatee's creator, The PARC Group, has a main goal of creating communities that balance the lifestyles of its residents. The PARC Groups's Chairman and CEO, Rodger O'Steen, founded the group in 1989 and was directly involved with the development of Nocatee, and many other communities. He had been named Northeast Developer of the Year in 2018, and The PARC Group has been claiming this title for a consecutive 12 years. Donna Lundgren, the manager for the Nocatee Welcome Center, explains that the actual word "Nocatee" has roots in Timucuan Indian and translates to "peaceful river". She also states that Nocatee is "approximately 25 square miles, 14,000 acres with over 60% of remaining preserve for conservation and preservation." This page was last edited on 25 March 2019, at 11:11 (UTC).